Today was a beautiful day so we took Sophie to the K-1 center parade in Fairhope. 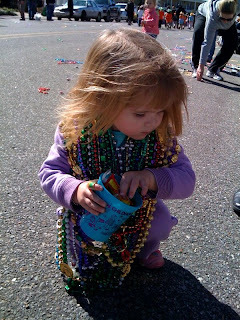 The kindergarten and 1st grade kids march in the parade and throw beads, candy, stuffed animals, moon pies, etc. Sophie loved it. She thought that it was so much fun to catch all the goodies. She would catch a few things and then throw them down and go pick up a bunch of other things. 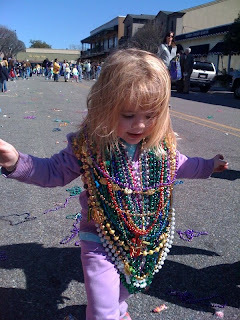 I think that by the time the parade was over she was wearing 5lbs worth of beads. Maybe we will go to a real parade soon, but it has been way too cold to get Sophie out for the evening parades.